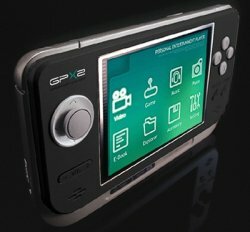 I've been spending my money again, this time on another handheld console to add to my ever growing collection - a GP2x. I've got its predecessor, the GP32, but this little beauty can do so much more. It can be used as a multimedia player and can play most common music file types, view pictures, watch XVID, DIVX and other movie types all on the go (useful when on those long journeys!!) Of course, the main reason I purchased one was for its ability to emulate so many old computers and consoles. PlayStation (albeit a little sluggish, but I got Resident Evil running fairly well on it). It can even emulate the very first computer I had - the Philips G7000!! I took this photo of Kieran posing earlier today and thought I would share it with you. Kieran, showing of the latest Autumn, Winter fashions!! Resident Evil 4 PS2 on PC? I like emulators.... Great little things they are! I have a reasonable spec PC which can play all of the latest games, and a good GFX card too, but I tend to spend most of my time emulating Commodore 64s, Spectrums, Philips G7000's, Atari's etc. 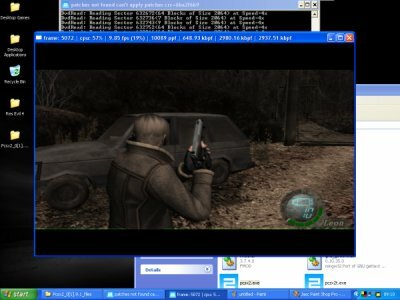 Yep, thats Resident Evil 4 running on my PC!! I downloaded the latest build of the PS2 emulator PCSX2, not expecting it to work as I thought we were still far away from a working emulator only to watch the opening sequence run, and then the title screen, and then the actual game, and it plays pretty well too!!! The sound isn't 100% (no speech) though, but the game runs at an ok speed... Playable at least! I long for the day when we just have one system, rather than having to go out and buy different consoles and computers just to play certain games. Ladies and Gentlemen.... May I present the finished model!! 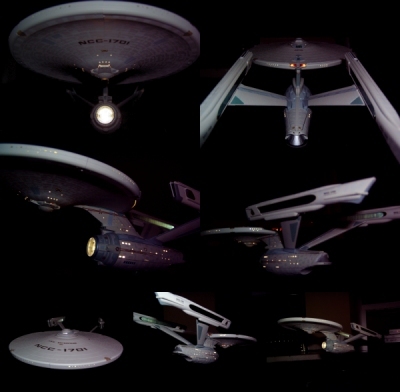 I've taken some low-light photographs of the model (above) to show just how fantastic the ship looks in the dark with all the lights switched on. The photos really do look like the real model used in the movies but HONESTLY, its the actual model I built!! It wasn't a difficult model to make to be honest, except for the wiring for the lights, but it all worked fine in the end and I'm really pleased with the result. 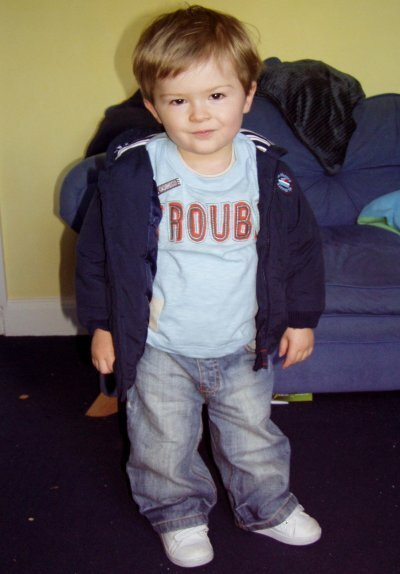 Well, my first day of half-term is nearly over, and while Michelle has been at work, I've been at home with Kieran. Infact, he has been such an angel for me today that I've been able to make good progress on my USS Enterprise model kit. The model is an extremely hard to find Bandai model which apparently has been discontinued for quite some time. Although slightly smaller to the well known ERTL AMT model kits of the USS Enterprise NCC1701, the detail on this kit is incredible, right down to the aztec patterns found on the hull of the ship. It also lights up, and I've had right fun and games with the cabling. Still, as you can see from the pictures, I'm slowly getting there. The picture at the bottom is a shot of a finished model and I hope mine looks the same when its finished. Not quite sure what I am going to do with myself mind you. I bought a fantastic model of the Starship Enterprise on eBay the other day, and that came through the post this morning, so I think I might work on that, assuming Kieran lets me. Might even fire up the ol' Gamecube and have a good round of Resident Evil as I haven't touched it in months (or the PS2 for that matter). I would strongly recommend visiting this wonderful little island to anyone who has never been before. Although our primary reason for going was to see my friend Fiona wed her (now husband) Peter, we still had one full day to go out and venture round the island. We stayed at a lovely little B&B in the heart of St. Helier called Surrey Lodge. The location was perfect as we were mere minutes away from the main centre of town, with all the shops and restaurants within walking distance. The main bus station was located just a few minutes away next to the harbour where we were able to catch an EasyLink hop-on-hop-off bus which travels around the island, stopping at all the main landmarks and attractions at a cost of only £7.50 for an all day adult travel card... Children under 16 go for free! 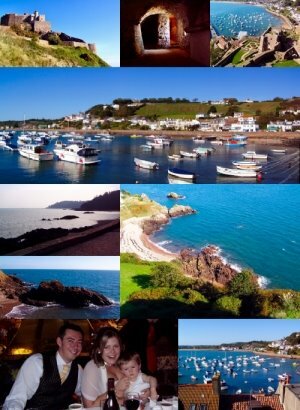 Jersey has so much to offer, and time was limited, so we decided to visit Mont Orgueil Castle, and the Jersey Zoo. Mont Orgueil Castle must be one of the best castles I have ever visited (and those of you that know me know that I have visited quite a few and how much I enjoy castles and ruins). The castle itself has only recently been re-opened to the public after some restoration work. Built in the 13th century, towering over the bay at Gorey, this apparently is one of the best preserved castles within the British Isles. With spectacular views over the island and across the sea to France, I would recommend this castle to anyone. Unfortunately, I had to leave Michelle and Kieran at the bottom while I explored the castle as there are quite a few steps to climb before actually reaching the entrance – pushchairs are a big no no. Still they found it fun wandering around the quaint little shops along the harbour. Jersey Zoo was a really great place to visit too. We went specifically for Kieran, and although I’m not a great animal lover, I did find the whole place interesting with a great variety of endangered animals on display. We could have quite easily spent an entire day there, but unfortunately we were limited by a few hours. Of course, as I mentioned earlier, the real reason we went to Jersey was to be guests at my friend Fionas’ wedding. The wedding was a civil ceremony which took place in a lovely little hotel/pub/restaurant in St Aubins called the Old Courthouse, with beautiful views overlooking the bay. The weather was gorgeous, and although Kieran was the only child there, he had an effect on everyone and made lots of new friends!! 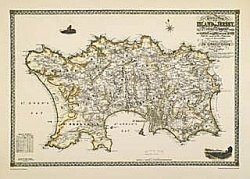 We are already planning our next visit to the island (hopefully sometime in early 2007). As I write this, it is 05:45 in the morning... Michelle and I are both tired, and Kieran is not the happiest little boy at the moment. In just under an hour, we are due to leave for the airport to fly to Jersey. Should be a nice coupe of days away (although the main purpose of us going is so that we can attend my friend Fiona's wedding). So... I shall not be here until Sunday evening which is when we return. No doubt I will post lots of pictures of stuff when we return. Until then, farewell!! Last night, I treated Michelle to a meal at a local restaurant in Evesham while her mum took Kieran round the annual mop (not the cleaning variety but a mobile fair for those who haven't a clue what a mop is) which takes over town once every year. Now, let me ask you a question.. What is it with Jean Michel Jarre and fairgrounds? Ever since I was a little boy, every fairground has to have Jean Michel Jarre (either Equinox or Oxygene) playing over the loud speakers. Have you ever noticed that? ... Not that I'm complaining - fantastic musician! I've seen kids at my school who can hack better than that! Trust me, the world has nothing to worry about if thats the best they can do!! Bring it on..... Death to Allah!!!!!!!!!!!!! My new website is coming along quite nicely... check it out to see what changes I've made - I've added and completed the CGI and Photography sections. On the advice from Dan, the boings have gone and have been replaced with a more relaxing ding sound, and the music now starts switched off as default, although I don't expect the song to stay on the site too long as it was only a quick song I wrote for testing purposes. 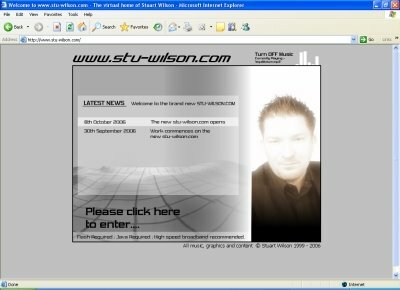 Also, for those of you who check my current stu-wilson.com, you may have noticed that some silly bugger hijacked my index page and put some rather shite crap about how the west are killing the east, and all that middle-eastern crap which is always in the news. Thanks to Pete for pointing that one out, ad its now all back to normal. ... wow... i'm getting all political!!! Beta version of my website available for testing! I've managed to get quite a bit done today on my new website, so I figured I'd stick a link to it here for you to have a look at - comments good or bad please. Remember that its still very early on in its development, and I'm sure I am to make many changes before I feel it is ready to replace the existing site. Apologies for the rushed music on the site - again, the song is nowhere near finished. Hi guys and gals! 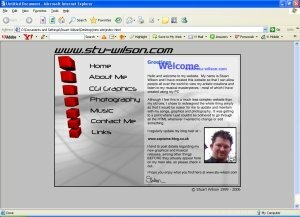 Well today I decided it was about time I redesigned my main website (www.stu-wilson.com). It hasn't had a redesign in over 2 years (which is quite long for me), so the image to the left is a small taster of what its going to look like. The problem with my old site was that because it was made from a combination of Flash movies and HTML, it was a nightmare to update and maintain, and it was so time consuming. The new site has been made so instead of having to work with a site made up from hundreds of files, it will only have a couple of files of which will need changing when I update. I seem to update my blog more than my main website, so hopefully this wil change. Expect the new website to replace the current one within the next week or two.